Posted July 1, 1996 by Josette Farrell in News. 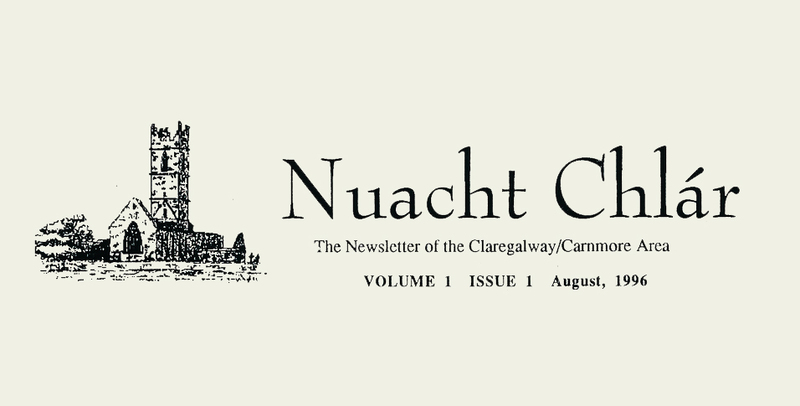 Nuacht Chláir is reborn! We intend this to be a monthly publication, providing up-to-date information and guidance for the Community. Whilst we hope to have regular features, including Football, Gardening, Beauty, Badminton, Video Review, Riding Centres etc, we would also welcome information about special events, Birthdays, Engagements, Lost & Found, Cookery Tips, Items for Sale etc. It is important that contributors provide their copy in good time for each month’s issue. May we suggest contributions to be made available to the newsletter sub-committee by the third day of each month. In an ideal world, these contributions would be available on a floppy disk (any format and any word processing package will do), but typed or handwritten copy will be equally welcome.